needed to assure the opportunities to success in the coming years. We accept boys and girls from one year old, that’s why we work on the acquisition of abilities and positive behaviors since children are younger in order to educate the best future men and women. 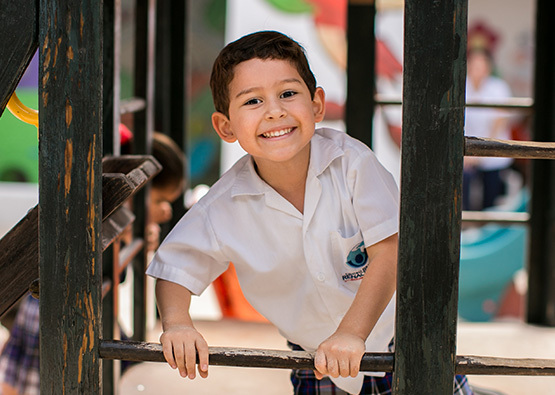 Our nursery and preschool is located in San Antonio Cinta, it has its own place for this important development stage, this gives our students a safe place that promotes the meaningful learning of the knowledges and competences needed to assure the opportunities to success in the coming years. We accept boys and girls from one year old, that’s why we work on the acquisition of abilities and positive behaviors since children are younger in order to educate the best future men and women. 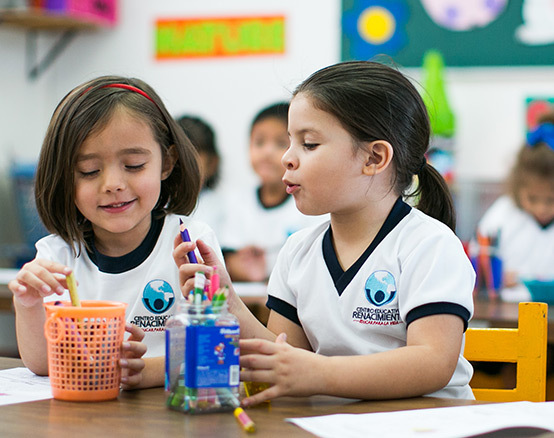 The teaching methodology of our nursery and preschool section is based on the development of competences; we work on all the necessary formative fields in this first stage of development in English and Spanish. Language and communication, mathematical thinking, exploration and knowledge of the world, physical development and health, personal and social development, expression and art appreciation and more. Besides, we use AMCO methodology which promotes multiple intelligences development and critical thinking, encourages cooperative learning in every student. In CER we are aware that English proficiency is essential for the present and future success in our students’ lives; for that reason we give them linguistic, oral and comprehensive skills of English in a natural way; guaranteeing a learning for life. In our programs we include a multicultural vision in which our students can see themselves as world citizens, living a life without boundaries. We can see in our students a citizen with the power to transform their society, that’s why we give them a personalized attention and education through a professional team properly prepared that, working in a closely way with the families, make them part of their education. We make the comprehension and the practice of human values part of the scholar life, forming that way, the foundations for a future healthy and happy life since the early childhood. MONQUI is a musical program focused on the skills development, the execution and the musical learning, creating happy moments and experiences through music, sound qualities, the musical sensibilización and execution as a mean of learning, in a completely bilingual environment. Our human development program wants to promote in the student a true and real self concept towards to a healthy self stem. CER student, acquires and make their abilities stronger through this program which helps them to be part of a social group and also helps them to get the best resources for the correct management of their emotions and the anger, they learn to face natural frustration with strength, to look up for solutions to their conflicts with classmates and to develop a cooperative and functional work. Every year in CER we make a sport family gathering, it’s an important event for educative community because it gives us the opportunity to know each other, work in teams and to have fun but the most is important thing is to enjoy and learn in family. In order to practice what the students have learned in English nursery and preschool students make themed assemblies and open classes during the academic year. Parents can come to the activities and observe the development and the motivation of their children for the English learning. We make Christmas and at the end of the scholar year Festivals where parents have the opportunity to see their children performing in a natural and funny way in the scenery, doing musical and art activities with different and unique topics. Nursery and preschool students go to supervised trips where they have the opportunity to practice the acquired knowledge in classrooms. Besides, these trips give students meaningful experiences which make them have lasted learnings. Our nursery and preschool students participate in the program “Star of the day” which gives them chance to be the main character of an English class for a day, they share their favorite activities, their family, their likes and what makes them be different and unique to their classmates. Once a year, our students ask their parents to observe and participate in an English class with them. Parents can observe a piece of an English class that our students take everyday in our bilingual system and at the same time they can participate in a meaningful and funny way.